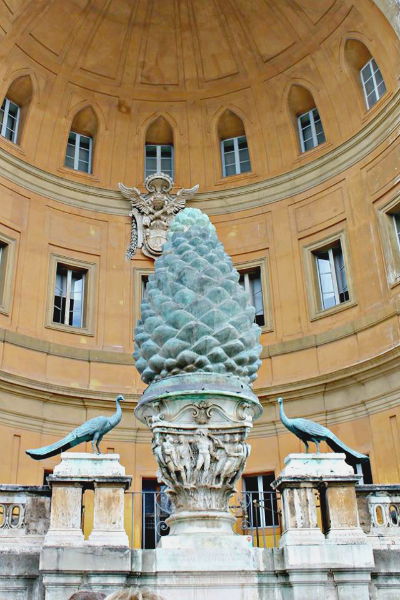 I’ve already recapped our adventures in Rome (see Part 1 here and Part 2 here), so today I’m focusing on our day in Vatican City. Vatican City is a sovereign nation within Rome and is officially the smallest nation-state in the world (by area and population). It maintains its own banking systems, post office, newspaper, and television stations. 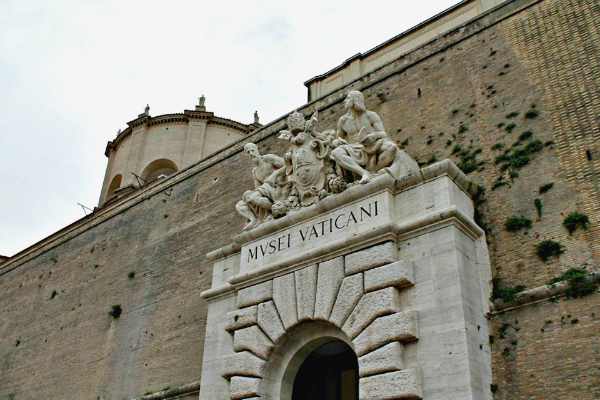 Vatican City is governed as an absolute monarchy with the pope as the head of state. We started out tour early because the Vatican Museums and St. Peter’s Basilica can get VERY crowded later in the day. We went with our tour group so I don’t really have any tips for visiting on your own other than to get there early. Honestly, that’s my #1 tip for sightseeing anywhere. Go early! We only got to see a small portion of the artwork and sculptures, but what we saw was amazing. 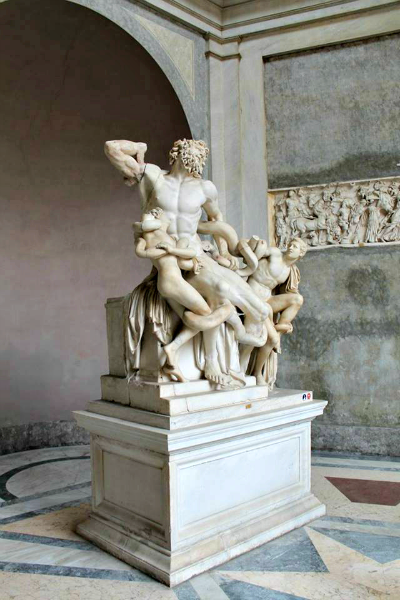 The marble sculpture below is Laocoön and His Sons and is one of the most famous pieces in the museum. It was excavated in Rome in 1506 and tells the story of Trojan priest Laocoön and his sons Antiphantes and Thymbraeus being attacked by sea serpents. Even the ceilings are gorgeous. Look at all of that detail! But none of those can compare to the Sistine Chapel. It’s breathtaking! 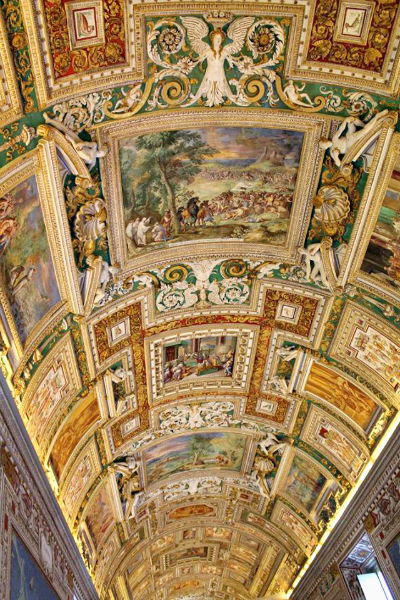 Michelangelo was commissioned by Pope Julius II in 1508 to paint the chapel ceiling. It took four years to complete and twenty years later he painted the Last Judgment over the altar. No photographs are allowed inside the chapel. They strictly enforce that rule and kick out anyone caught taking photos. They also ask for silence while inside the chapel. Our next stop was St. Peter’s Basilica. 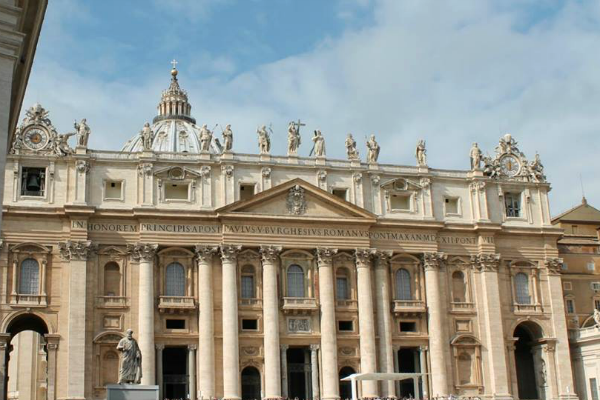 St. Peter’s Basilica is one of the largest churches in the world and remains one of the holiest sites in Christianity. It stands on the site where Peter was crucified and buried. The most recognizable part of the basilica is the large dome, which was designed by Michelangelo. It can be seen all around Rome - you might have noticed it in some of the pictures in my Rome posts. 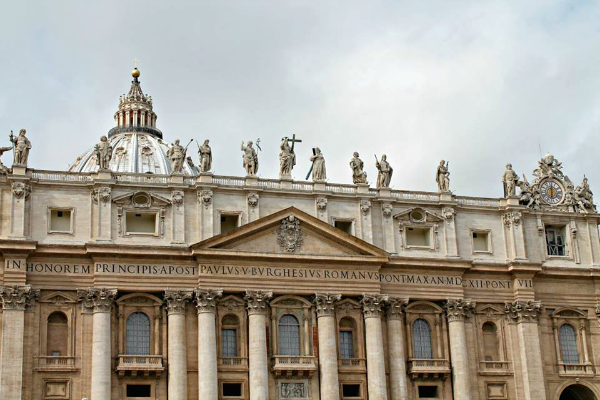 The façade of the basilica is topped with 13 travertine statues representing Thaddeus, Matthew, Philip, Thomas, James the Elder, John the Baptist, Christ the Redeemer (in the center), Andrew, John the Evangelist, James the Younger, Bartholomew, Simon and Matthias. The inside of the basilica is even more impressive. 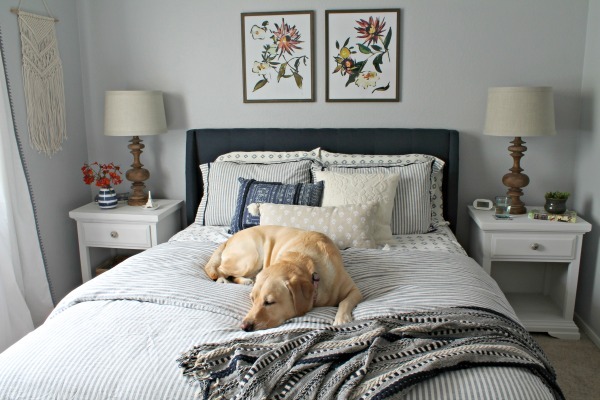 Every bit of space is intricately detailed, elaborate and features pieces from some of the most talented artists of the time. 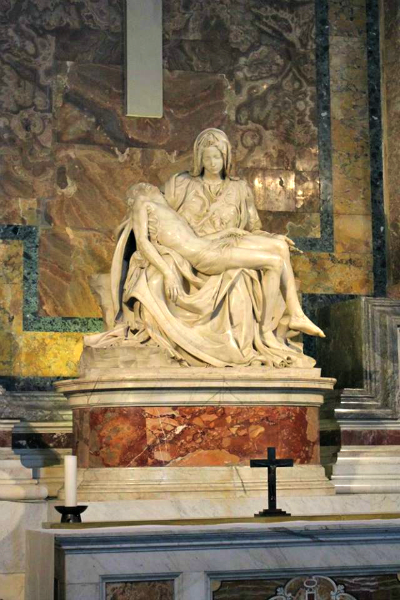 Michelangelo’s famous Pieta is just inside the basilica on the right. It’s protected behind a sheet of glass after a crazy man welding a hammer attacked it in 1972. 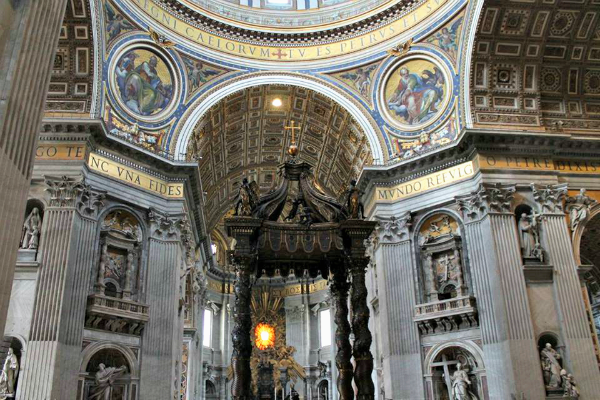 Below is the dark bronze canopy that covers the shrine of Saint Peter. At the top of the picture you can see where the dome starts. 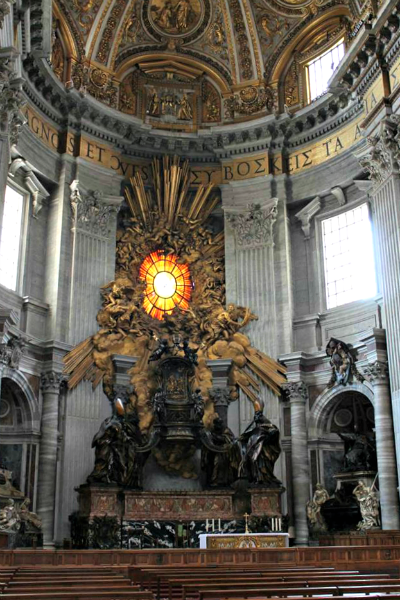 St. Peter’s Chair, the gilded bronze monument below was designed by Bernini to enclose an oak throne from Charles the Bald upon his coronation in St. Peter's in 875. 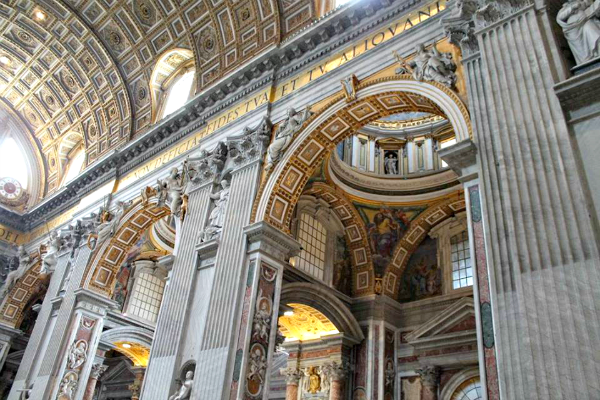 As you can see the inside of St. Peter’s Basilica is beautiful and quite detailed. It’s definitely a little gaudy, but most of them are (is that sacrilegious?). After we finished exploring the basilica we stepped outside to enjoy the view out onto St. Peter’s Square. There was an event the night before so you can still see all the chairs that had been set up. 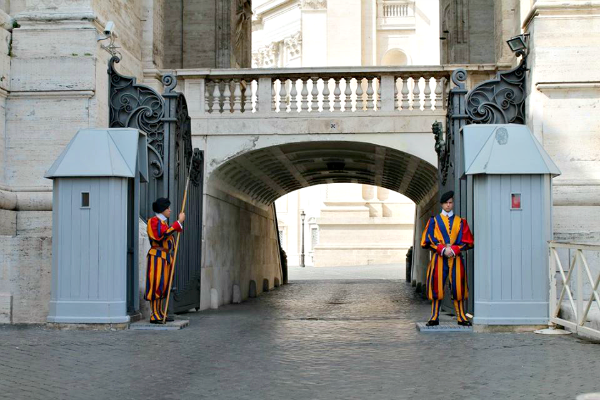 Of course what’s a trip to Vatican City without mentioning the Swiss Guards. Their uniforms may look funny, but they’ve been faithfully serving and protecting the pope since 1506, which makes them one of history’s oldest regiments. Membership is open to Catholic male citizens of Switzerland who have completed military school. 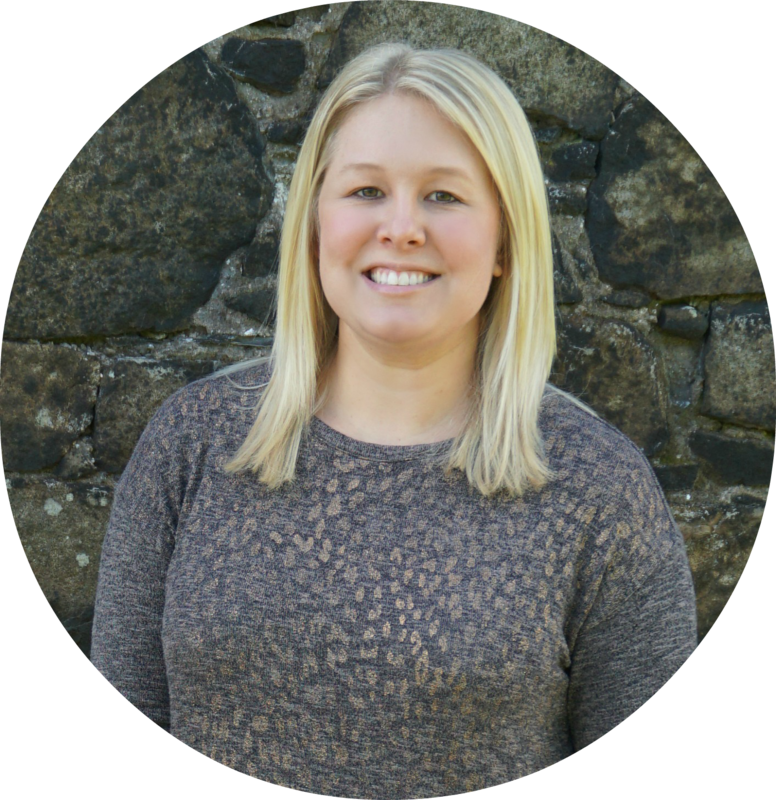 Applicants must be between the ages of 19-30, at least 5’8”, and not married. After that we stopped at the official Vatican gift shop. My mom and I bought angel ornaments for our Christmas trees (you can see it in last year's Christmas home tour post). For no additional charge, they’ll have your item blessed (by a member of the Vatican clergy I assume) and delivered to your hotel later that night/next day. The gift shop is definitely worth a stop. If you want to see how we spent the rest of the day, you can read my Rome Part 2 post here. 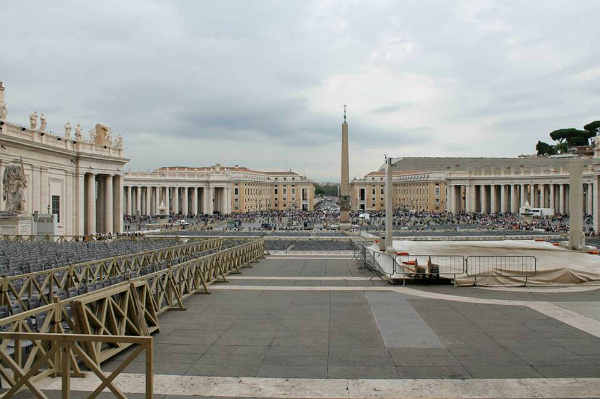 I only visited the museum and the square area, during my visit to Vatican. So enjoyed your beautiful photos from inside St. Peter's basilica. The Laocoon is one of my favourite statues, so much expression. I could spend hours in the Vatican, what a place! 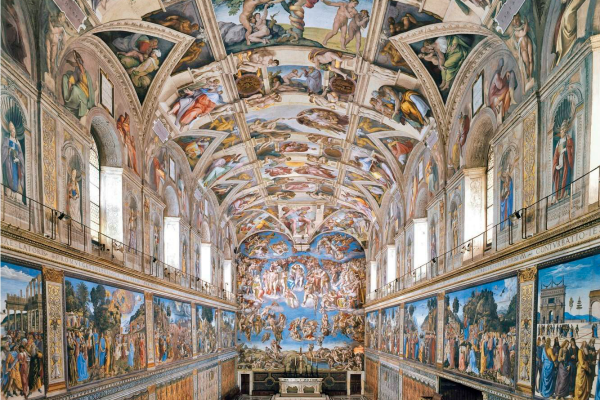 Were people respectful in the Sistine Chapel when you were there? When I was there I was disappointed at how disrespectful people were. It was as if it had not been announced that talking was prohibited. Your pictures and commentary are good. I enjoyed the Vatican and St. Peter's. Quite a lot to take in. Interesting to see the Swiss guards and hear about them. Somehow we missed that. Yes! They asked for silence multiple times and it didn't seem to make a difference. We also saw a couple people being removed, probably for taking pictures.